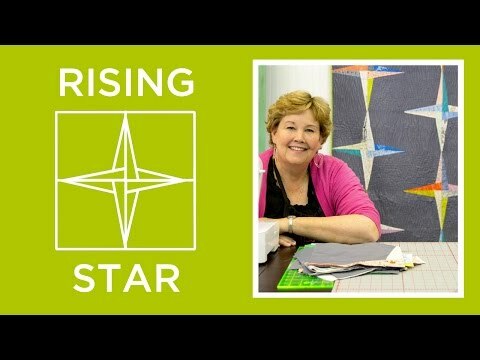 Bring sparkle and shine to your holidays with a radiant Rising Star quilt! It's perfect for snuggling under the tree. Designed exclusively for Missouri Star Quilt Co., this pieced quilt kit contains a pattern and Let it Sparkle fabrics for the top and binding, including precut 10" squares and 2 1/2" strips, by RJR Studio. Backing sold separately, 3 3/4 yards needed. We recommend Let It Sparkle - Holiday Bouquet Radiant Black with Red Glitter Yardage. With the purchase of this Missouri Star Exclusive Kit, you will receive 10% off Machine Quilting Services. Finished size: 57" x 66 1/2"